“The Angels of KZN” is a group of biker ladies who love riding their bikes with family and friends and have a passion for helping out their local community! Striving to be involved in as much charity work as possible, they welcome any like-minded ladies from all chapters and bike brands to join in their endeavours. Previously The Angels have, in conjunction with HDCSA, worked in Ethelbert children's home and they plan to return there soon. They also recently had a collection to provide toiletries for Queensburgh Old Age home and plan to do a shoebox of Christmas goodies for them as well! 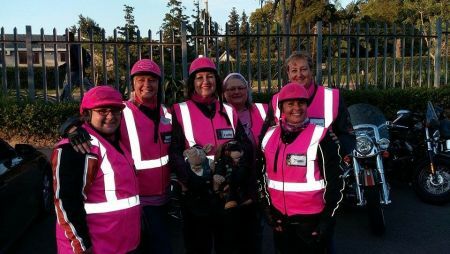 These exceptional ladies recently rode all the way out to the Rally in the Valley in Robertson in aid of “Look Good Feel Great” - a wonderful cause which helps to rehabilitate and aid breast cancer survivors. Fellow Angel, Ingrid, is a breast cancer survivor so this cause is very close to their hearts! activities and the reception at the rally was the cherry on the cake. Our sincere thanks for all the love and hugs and good wishes from everyone. So many of our new friends have started following us on FB that we feel like celebs! You have embraced us like sisters and we appreciate it so much!"